Kelli Hollinger joined the Center for Retailing Studies (CRS) in 2004. She held various leadership positions within the organization, becoming director of the Center in 2014. In this capacity, she directs the advancement of undergraduate retail curriculum, research and executive education programming offered at Mays Business School. Through the development of new and existing corporate partnerships with more than 30 of the nation’s largest retailers, including Walmart, Walgreens, Macy’s, H-E-B, PetSmart, GameStop, ALDI and more, she advances the Center’s reputation as one of the nation’s leading centers of retail education. With a background in student affairs before joining Mays Business School, Kelli is passionate about student development. Between 2005-2014, she coordinated the retail internship program and taught MKTG 484 Internship every semester. Under her tenure, students interned in a great diversity of retail and marketing firms with 140 companies across the US and abroad. 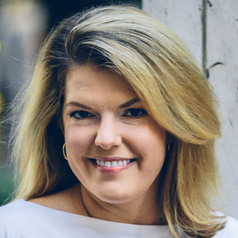 Through active involvement with the National Retail Federation, she has coached undergraduate teams to national level competitions and wins to develop products for Starbucks and Babies”R”Us. Since 2006, she has served on the Texas A&M Career Center’s advisory board. Currently, about 150 students are engaging with the Center for Retailing Studies through classes, clubs, internship and competition involvement. Kelli eagerly gives back to the College Station community, holding board and chair positions in the Junior League since 2003.